With the introduction of the Dual Fluid Reactor, Germany places itself in the middle of the race towards the development of a commercial molten salt reactor. The concept of the DFR has been developed by a group of scientists at the Institute for Solid-State Nuclear Physics (Institut für Festkörper-Kernphysik) in Berlin, Germany. The DFR differs from the other molten salt reactors in several important ways. First, the fuel fluid and the cooling fluid are completely separate, instead of being mixed. This allows the operator to optimize each fluid for either its fuel or coolant properties. The design allows the burn-up a wide array of nuclear fuels, including existing stockpiles of spent fuel from light water reactors. 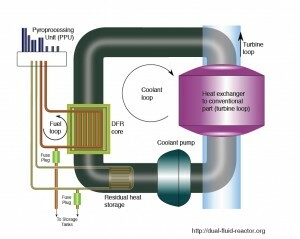 Being a true fast reactor, it produces only small amounts of waste, that need to be stored for about 300 years. In the design presented in March 4-7, 2013, for the “Fast Reactors and related Fuel Cycles” (FR13) conference in Paris organized by the International Atomic Energy Agency (IAEA), the fuel may consist of different mixtures of uranium and thorium salts or uranium and plutonium salts. The coolant is liquid metallic lead – the second liquid that the name DFR refers to. In the core, the fuel salt runs through an array of small tubes (about 10.000 of them) that is cooled by the lead. The lead also acts as a reflector for the neutrons released in the fission. The process temperature is well above 1000 °C, several hundred degrees hotter than both the IMSR and the LFTR. This high operating temperature is made possible by the use of refractory metal – the entire primary heat exchanger is made out of this precious material, that has an extraordinarily high melting temperature. The design that is published does not specify which refractory metal is used – there are at least five candidates – but even the one that has the lowest melting temperature, molybdenum, melts above 2200 °C, at a comfortable distance from the operating temperature. The designers claim that the high cost of employing these exotic and expensive materials is negligible in the total Energy Returned On Investment (EROI). And now that we are talking money: the price per kWh for the DFR will be lower than the present price per kWh produced with coal. A remarkable feature of the DFR is the very compact and straightforward design of the core (see picture). It combines ingenuity and sturdiness in a small space, making it ‘very German’. For ease of production, the core is a cube. It can be, as it does not have to withstand high pressures. To produce a staggering 1GWth, the cube needs to have an edge of about two meters. It uses much cheaper and less toxic salts than the LFTR (DFR uses chlorine-salts, rather than fluorine, and needs neither toxic beryllium or expensive lithium isotopes). The second picture shows the core placed in the primary coolant loop, consisting of molten lead. Using lead as a primary coolant has many advantages. First, in the core, the excellent reflecting properties of the lead make for a very good neutron economy. Simply put, this means that most neutrons are used for nuclear reactions and do not get lost. 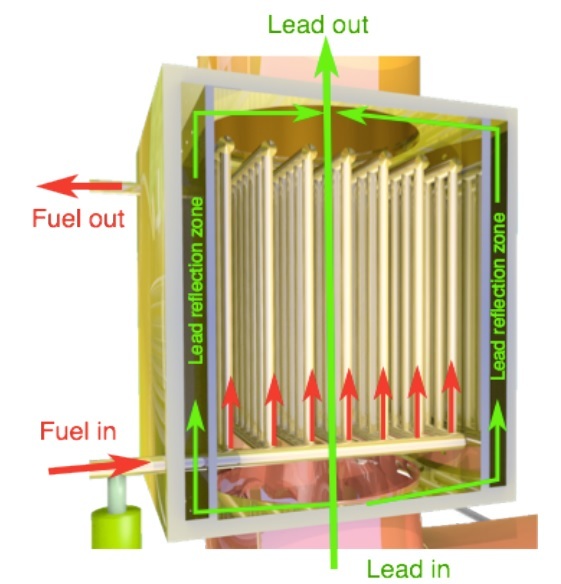 Another advantage is that lead picks up very little radioactivity when it flows around the core tubes. This means the primary coolant loop can go straight to the conventional part of the power plant to release its heat. Placed in the lower part of the lead loop is a ‘residual heat storage’, an additional feature for storage of actinides, reaction products that are no longer of use in the core but produce heat nevertheless. They can remain here untill they’re safe to handle. Of course, the DFR has the attractive properties shared by all MSR’s, most notably its inherent safety: it operates at ambient pressure, hence no expensive pressure vessels or reinforced containment buildings are necessary. There’s no explosion risk. A melting plug ensures that in a case of emergency, the reactor shuts down in a well behaved manner: it will follow the same procedure as in a regular shutdown, even in an unhoped-for unattended situation. If, for whatever reason, the core temperature starts to rise above the regular operating temperature, the nuclear reaction becomes less efficient, while the reflective properties of the lead diminish at the same time. Both effects eventually cause the nuclear reaction to slow and finally stop. 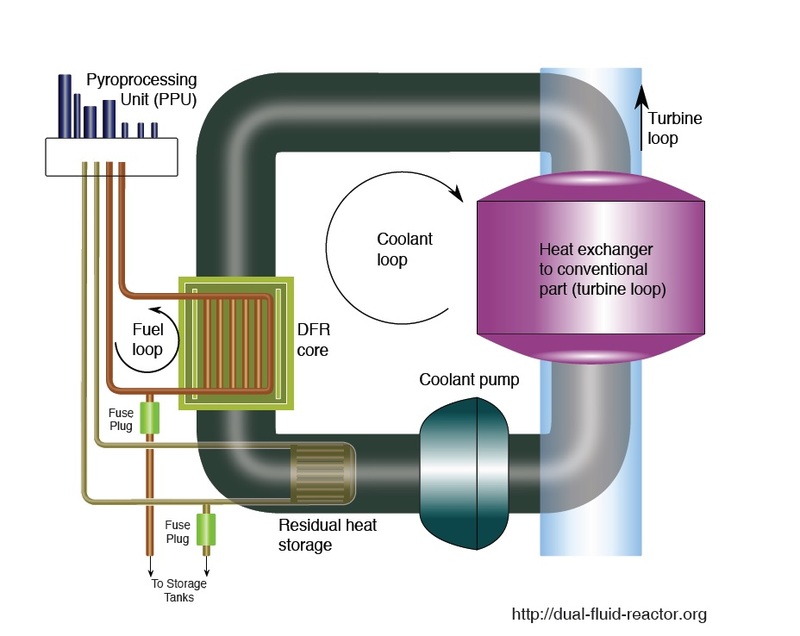 Using these same properties, the reactor is load-following: the more it is cooled by the production of energy, the more efficient the reaction will be and the more power it will produce. And it burns up all the fission energy of its fuels, about a hundred time more than a conventional reactor uses. The concept presented is for a power plant that produces 3GWth and 1,5GWe. It includes an online fuel reprocessing unit that keeps the fuel in optimal condition. The design however is versatile. Smaller, even mobile versions of the DFR are conceivable and can be made suitable for once-through fuel use – more convenient on obtaining green light from the regulatory authorities. – extends the thorium scope to 100 million years. Accessible space resources not included. To sum this up: where Sorensen with his LFTR is aiming for the Ferrari of nuclear and LeBlanc for the Volkswagen, the developers of the DFR are creating the Mercedes.